Pay to play or free all-the-way? Do 128-tick servers really make a difference? What about anti-cheat? 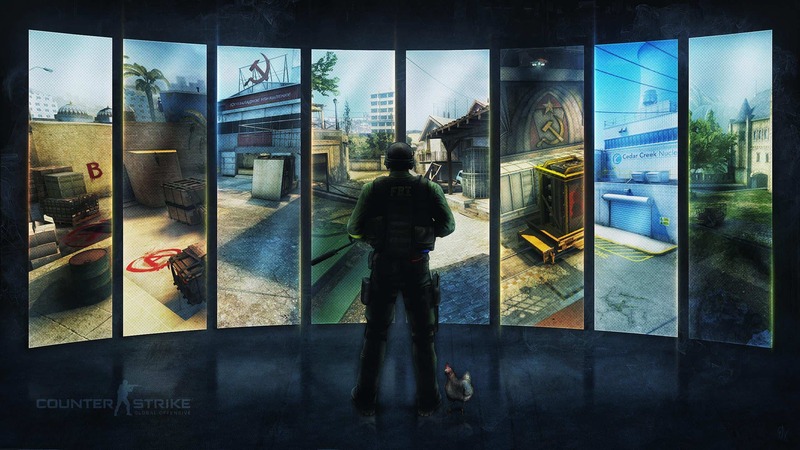 Often, we here at CSGO2ASIA find ourselves playing on several different platforms depending on our current mood, overall form and who we’re partied up with. While this may differ for you, we sat down to take a look at the top options for an aspiring CSGO player in Asia and what choices he really has. 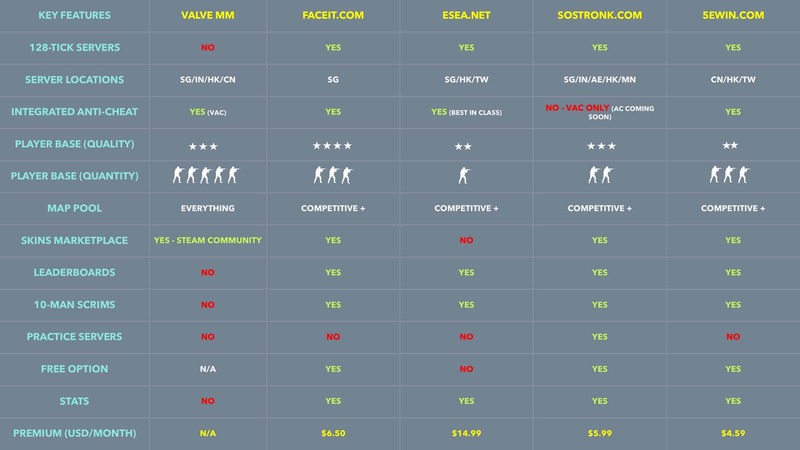 In running our comparison, we only speak of the top platforms based on current popularity, and while there are others such as challengeme.gg, today we are focusing on the four best-known platforms in the Asian region: FaceIT, ESEA, SoStronk, and 5EWin. Edit: our graphic wrongly indicates that 5EWin has Taiwanese servers. This is incorrect. Ultimately, the location of a platforms servers could be the single most important factor in determining whether you play on it or not. 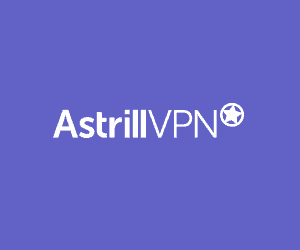 Because of the nature of Asian internet routing, sometimes this can be very frustrating. While all the platforms here have choices, FaceIT is the only platform that has made do with a single location, Singapore. Surprisingly, this hasn’t affected their player numbers drastically, but for many that ping poorly to Singapore this is a very limiting factor. Valve MM servers are arguably the most stable and consistent, however, the major drawback is, of course, playing on 64-tick. For anyone who wants to seriously up their game, 128-tick servers are the only way to go. Everybody knows that the Valve Anti-Cheat (VAC) is a poor detection engine and severely outdated. For a long time now, many players prefer to play on platforms outside of Valve MM purely because of this reason. At the higher ranks of Valve MM, rampant cheating is still an issue and really ruins the game. This doesn’t mean that platforms are immune to hackers, as, with anything, where there is a will, there is a way. That being said, it is no secret that the best anti-cheat out there belongs to ESEA, and while they pride themselves in having the best anti-cheat system, it comes at a heavy cost to the user. FaceIT most recently rolled out their anti-cheat which works both server-side and client side. Currently, only a select amount of players need to download and install the anti-cheat client, but FaceIT will be making this mandatory for all players in the near future. Meanwhile, SoStronk is behind on the anti-cheat band wagon, but we have word from the development team that a robust anti-cheat is not so far off. As you get better and more competitive in the game, there is nothing worse than playing with terrible team mates or enemies as the thrill of the challenge quickly disappears. Valve MM is a good choice for the “casual competitive” player who doesn’t really care about stats, but as you climb the ranks, the quality quickly diminishes as hackers are rampant. Without a doubt, when queuing for games on FaceIT you are bound to come across some of Asia’s top players. The overall average skill on FaceIT is probably the highest. SoStronk recently rolled out a solo matchmaking ranking featuring an invite only list of Asia’s top players called ‘Next‘. With this feature, at the moment, if you want to play with the absolute best Asia has to offer, SoStronk is the way to go. The sheer number of players that ‘play it safe’ make Valve MM the home for the most players. Coming in at an easy second is FaceIT. Because of its location, 5EWin has a large predominantly Chinese player-base, but ultimately, you can’t beat MM for the total number of players. Even queuing at 6am you could potentially find a game on MM. In summary, FaceIT has a better average skill while SoStronk is the place to go if you want to play a PUG against BnTeT. How do you know how you fare against the rest of the competition? This is something that any serious player needs to know. SoStronk has a robust leaderboard system that features a free, silver, gold and next. Climbing the leaderboard rewards you with SoStronk points and is based on their impact rating system. FaceIT bases their ranking on your ELO score, the total number of wins has the biggest impact here, and similarly, this rewards you with FaceIT points. While FaceIT has the most diverse regional players in Asia, giving a good indicator, SoStronk is currently the only platform in Asia with a direct path to an exclusive solo-match making ladder with cash prizes. Other platforms like ESEA and 5Ewin don’t have the same benchmark because of their different (or lack thereof) player base. Many of the platforms here have something unique to offer. Features like skins marketplaces, points systems, redeemable items, and statistics are common place; there are simply too many features to list! However, we did want to highlight the competitive team focus that SoStronk has chosen. SoStronk includes on-the-fly practice servers, scrim listings and an intuitive client for scrimming other teams easily and efficiently. This focus on professional teams also means that SoStronks statistics for each game played are some of the best for understanding how your skill is improving over time. Honorable mention goes out to ChallengeMe.GG for their 1v1 and 2v2 matchmaking modes, we really enjoy playing these modes too! The free option always sounds nice, until you realize what you’re missing out on. For what they ask, we understand that the vast majority of people won’t ever convert to paid subscribers. But if you’re looking to put your money into a platform, we believe with its overall features and recently release path to glory, Next, SoStronk wins in terms of the best value for money. Surely ESEA would be wise to take a look at their pricing considering the steep asking price of US$14.99/month. It is worth mentioning here, however, that all the platforms listed offer discounted rates for 3-month, 6-month, and annual subscriptions with SoStronk even offering a one-time lifetime subscription of US$149.99. Learn more about the different options here: 5EWin, SoStronk, FaceIT, ESEA. So there you have it, our round up of the best platforms in Asia. Ultimately, with its diverse and skilled player base, relatively good ranking and anti-cheat system as well as a robust leaderboard and marketplace, FaceIT takes the top spot for our choice of the best CSGO platform in Asia. However, coming in at a close second is up and coming Asian platform, SoStronk. The release of their anti-cheat client in the near future will no doubt push them to be an even closer contender to FaceIT, and we wouldn’t be surprised if they eventually come out on top. Philippine CS:GO: Where Does it Stand?